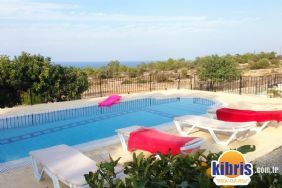 This charming villa is located in Catalkoy overlooking the beautiful mountains of Northern Cyprus. This is the perfect getaway for those looking for a serene and natural atmosphere, while still only minutes from the beautiful town of centre with beaches, marina, golfing, resturants, shopping and many more. The villa takes its name from the old Carob tree which lies in the colourful landscaped gardens. Guests are welcome to eat the Carob pods. The master bedroom has a balcony, en-suite dressing room and shower room. There is a built in safe, a music system and a small fridge. Villa Carob has over 20 films and over 20 PS1 and PS2 games. You will enjoy beautiful mountain views from the spacious garden with and also from the living/dining areas. The full kitchen has everything you need for a romantic dinner for two or a family feast.